The badge above was made in 1888 for the Cincinnati Police Department. It is one of 20 badges that were ordered. Portions of the 1888 City of Cincinnati Annual Report mention this badge. 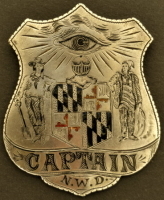 The badge is made of German Silver with a Gold Center Seal. The "T" pin is original to the badge as is the "C" clip that holds the pin. 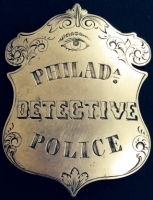 The item to the right of the badge near the bottom is known in Cincinnati as a "Whistle Hook". A chain was attached to the officers whistle and the opposite end of the chain was attached to the whistle hook. This prevented the whistle from being lost. Note from Pat Olvey, Police Historian: Your badge (#3) is in excellent condition for its age and is extremely rare. No more than 3 others exist in the same condition as yours. The attached pages are from the 1888 annual report. 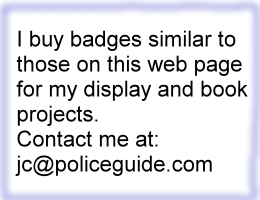 The attached pages describe that a badge was being made for the lieutenants on the force and the design was approved and accepted by the Board of Police Commissioners. Patrick Olvey, Historian-Greater Cincinnati Police Historical Society. Pictures of Cincinnati Police Lieutenants. Courtesy of Pat Olvey, Historian-Greater Cincinnati Police Historical Society.